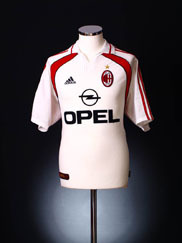 The AC Milan shirt sponsor from 2002 to 2003 was Opel. Relive Andriy Shevchenko’s 2002/2003 season with this vintage Adidas AC Milan away football shirt. 2000-02 AC Milan Grey GK Shirt Adidas Original Vintage shirt from Classic Football Shirts Ltd.